We continuously update this page with new content, so check back here for more helpful tips. Check it out if you’ve got some queries! If it doesn’t cover your questions, please let us know! How to install Houdini MC? Step 2: Double Click on HoudiniInstaller.exe. Step 3: Select “Clean Install” and press “Next”. Step 4: Wait for a few moments and click on “Launch Application“. During the first execution, Windows will ask you TWICE to access the execution of the file. The first prompt is about the IIS Express Server and the second one is about Houdini MC. Click and uncheck the “Always ask before operating this file” and click on “Run“. Problems with Chromecast. I am able to cast any page to my Chromecast using my normal chrome browser just fine, but when I attempt to cast my Houdini in-room screen it fails every time. How can I solve that? I'm facing several issues with AudioRouter. Can Houdini MC recommend us an alternative? 1. How can I get my computer ID? Please download, install and execute Houdini MC. After executing Houdini MC, a splash screen will display the computer ID. Either press the Copy button or type it down carefully. Send us an email with the ID at support@houdinimc.com and we will issue the serial. The maximum turnaround time for issuing serial numbers is 12 hours. 2. Can I execute Houdini MC on a Google Chromebook? 3. What are the minimum requirements to run Houdini MC? 5. How can I change the language of the interface? 6. What languages does the software interface support? 7. Can I store my clues in any language? Of course!!! Using Room Editor, Houdini MC allows you to organize the available/predefined clues in any language. 8. I was trying to create a new text clue using Room Editor but unwanted formatting appears each time (white background, strange fonts etc.). How can I remove this formatting? We assume that you have copied the text from MS Word (or any other software) directly to the Room Editor. To remove formatting please paste the clues firstly on a notepad. Then copy again the text from notepad to room editor. 9. As a game-master, can I cast the clues on a tablet or on a mobile device? Houdini MC allows you to cast to any connection on the same network device the text and the image clues by default. Moreover, Windows 10 operating system and some Android versions allow you to also send audio and video clues as well as the soundtrack of the room. On Windows tablets/phones, by default sound and videos are allowed. For Android tablets/phones please follow this tutorial to change the <Play sounds> permission. Moreover, Google introduced a new flag in Chrome 61 which gives users of the web browser control over the browser’s autoplay behavior. Load chrome://flags/#autoplay-policy in the Chrome browser. 10. As a game-master, can I gift the players with bonus time? 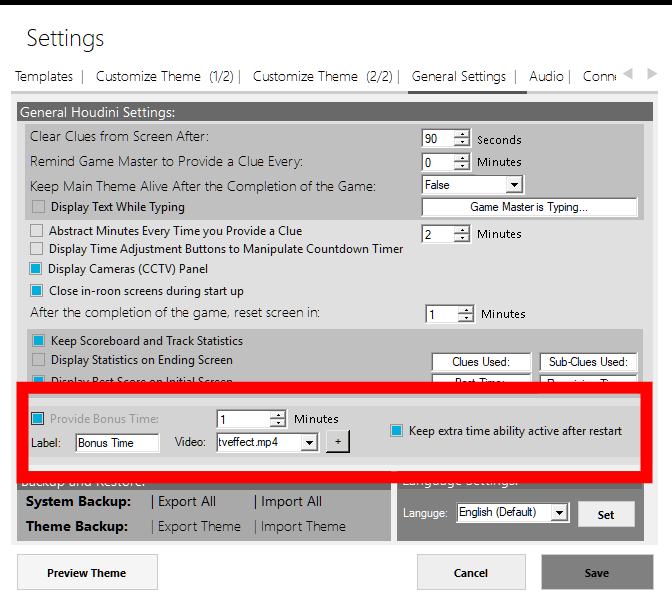 Houdini MC allows you to gift your players some extra time, after the completion of the duration of the game. 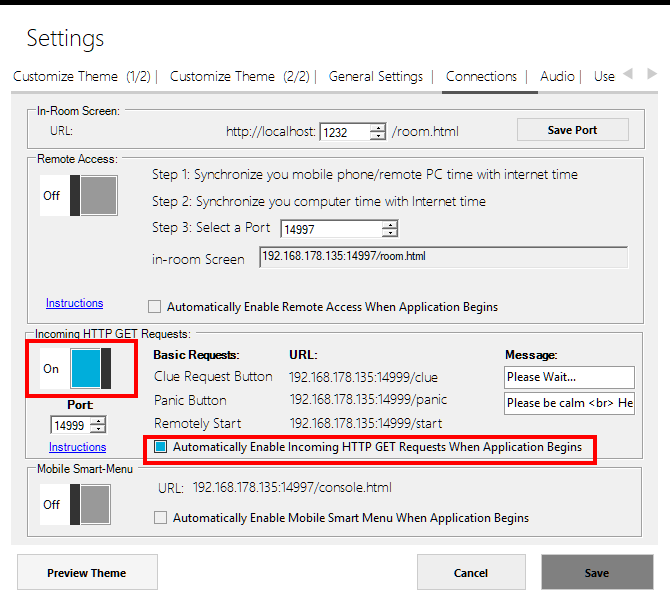 To enable this feature go on Settings->General Settings and select the duration of the extra period. Using room-editor you can set a different soundtrack for this period. Moreover, using scheduled events you can set custom events for this period. 11. How can I connect the Escape Room TV with Houdini MC? Please follow the instructions from here. Step 2: Connect your speakers to the TV’s Audio Output. There is no need for wiring from the master control room to the escape room. Houdini MC transmits the main sound theme, additional sounds and more, directly to your TV through Chromecast. Step 3: Execute Houdini MC. 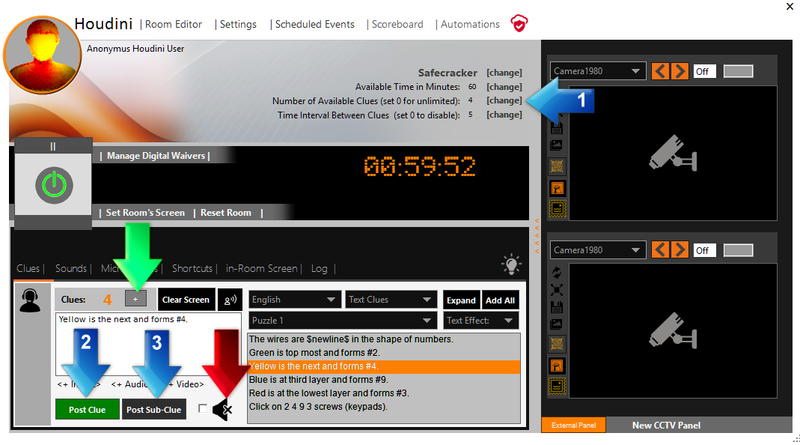 Right click on the in-room screen and select <Cast>. Select “Cast this Tab”. 1. An Escape Room Screen clone is available to the game master, listed in menus as an in-room screen ->”New muted instance”. This option activates a new browser instance in which, the game master monitors the players’ screen. 2. 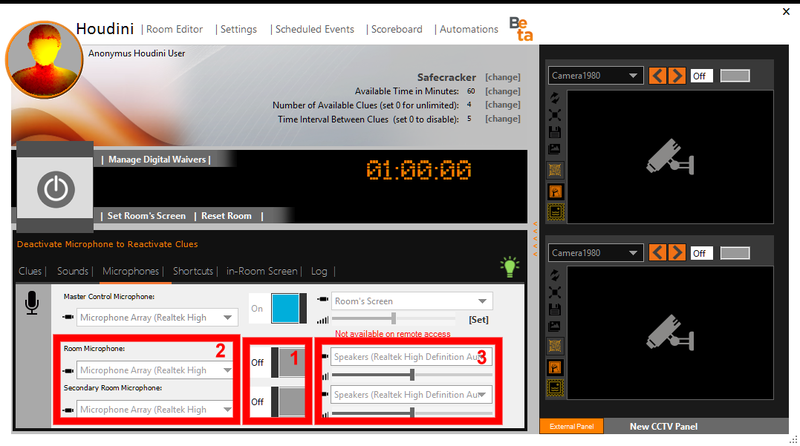 By pressing a single button ( in-room screen -> Capture every 2 seconds), the game master can capture in real time a screenshot from Escape Room Screen. 3. 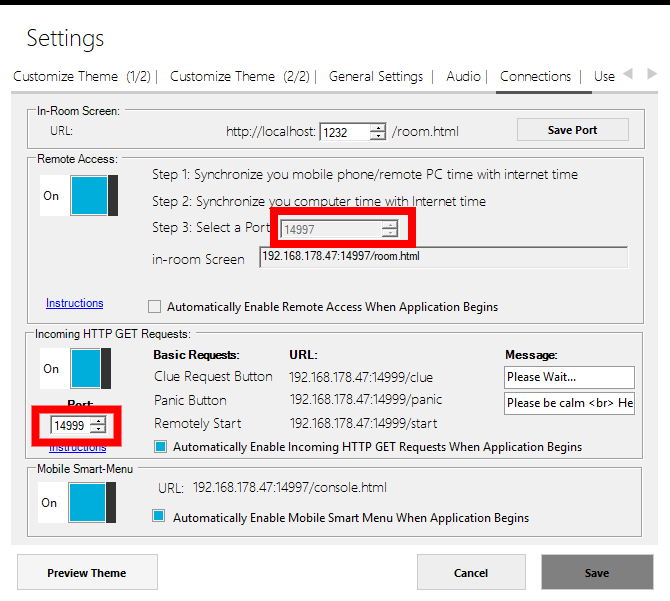 Houdini MC implements a proxy server providing the ability to monitor in real time the Escape Room Screen in any portable device (such as mobile phone, tablet, etc). 13. I'm using one PC to control several rooms (one at each session). How can I automatically load the new room parameters each time? Simply go on Settings-> general settings and select Export All. This will generate a single file with all the room parameters. Save this file on a safe location. Repeat this procedure for all the rooms. Every time you want to load this file so as to operate the specific room, simply go on Settings-> general settings and select Import All. 14. What is the difference between clues and sub-clues? Houdini MC allows game-masters to provide a predefined number of clues. One can define this number by using either the “Room Editor” or by directly modifying the value next to the “Number of available clues” label (click on “[change]” label, enter the preferable number and press “Enter” key see Arrow 1). Moreover, the game-master can add additional clues on the fly during the game by pressing the “+” button (kindly refer to green arrow). Every time you press the Post Clue (see arrow 2) button, this number of clues is decreased by one. The remaining clues are listed on the top of the shout-box. 15. How can I display the in-room screen in full size? Click on the in-room screen window and press the F11 key on your keyboard. 16. Can I use a different browser? Houdini’s Escape Room Screen is fully compatible with HTML5 ready browsers, but we suggest you take the advantages of Chrome browser. 18. How can I connect and control my camera? Houdini MC supports IP (RTSP) cameras only. Moreover, the embedded CCTV system provides only the ability to monitor the video content (not the audio) of the cameras. Unfortunately, we use a third party library to monitor the cameras and we do not have the ability to extend the provided functions. If your cameras are not 100% compatible with Houdini MC, then you can use alternate solution to monitor the cameras ( such as the official software of the cameras or a freeware solution). Of course, the embedded CCTV platform is useful in case you want to incorporate QR codes’ based puzzles. In order to add your camera’s stream to Houdini MC, you need to determine RTSP URL. In general, each camera uses a different RTSP URL. 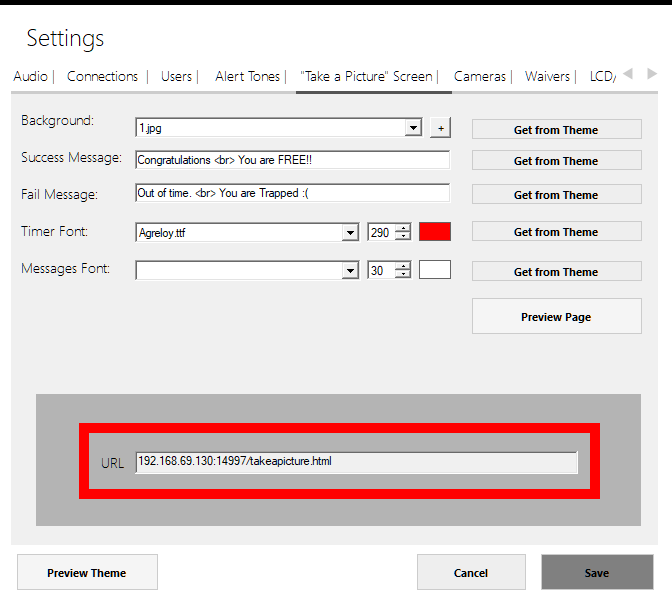 iSpy software can help you locate the RTSP URL for your camera. 19. How many licenses do I need? Licenses are per PC. So you need one license for each PC. 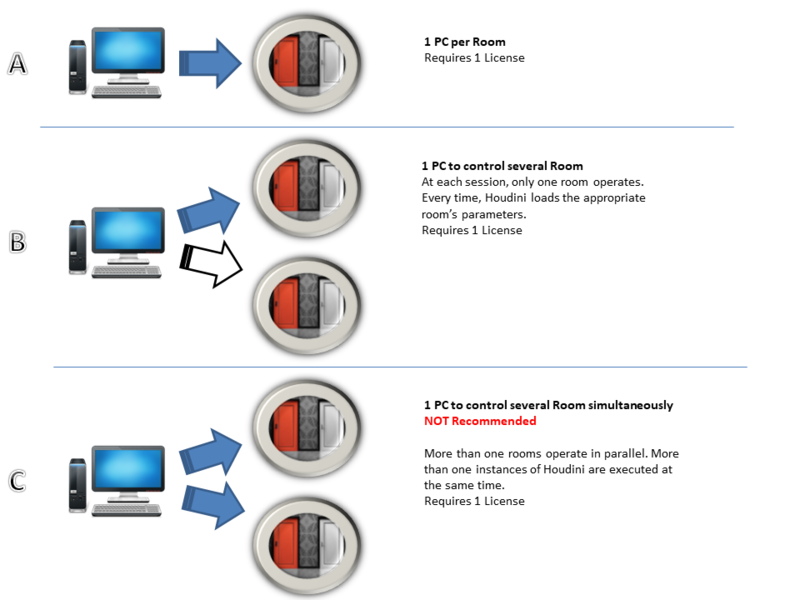 You can either use one PC per room or use one PC to control several rooms. These several rooms can operate in parallel or not. All reported cases are illustrated in the following image and require only one license. It is worth noting that we strongly recommend our customers, based on our experience, to use one PC per room. Scenario 1: Your company consists of 6 rooms and 6 PCs. 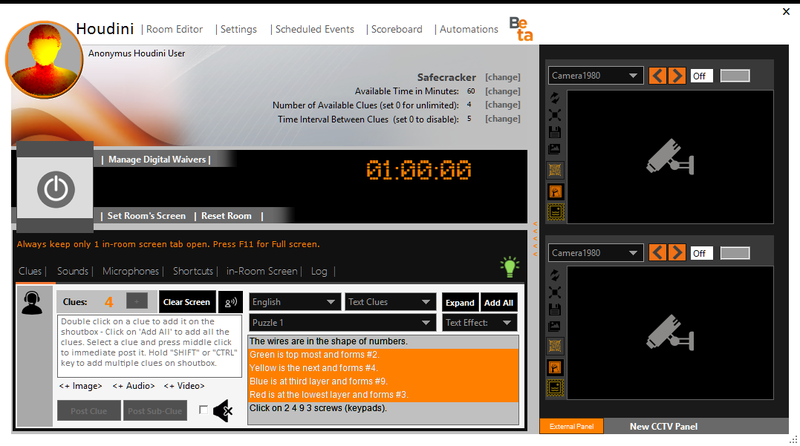 All the rooms may operate in parallel (controlled by a different PC). Then you need six licenses. Scenario 2: Your company consists of 6 rooms and 1 PCs. You use the same PC to control all the rooms but at each time, only one room operates. Then you need one license. Scenario 3: Your company consists of 6 rooms and 1 PCs. You use the same PC to control all the rooms and all the rooms operate in parallel. Then you need one license. Scenario 4: Your company consists of 6 rooms and 2 PCs. You use 2 PCs to operate all the rooms in parallel. Then you need two licenses. Scenario 5: Your company consists of 6 rooms and 2 PCs. You use the same PC to control all the rooms and all the rooms operate in parallel. But you also have a backup PC. Then you need two licenses. 20. Can I upgrade my purchased pack to a higher one? Sure! You can upgrade to a higher pack and will only need to pay the difference. 21. I bought 3 licenses but at the moment I only need one. Can I contact you later when I need the other licenses? Sure! Just send us an email with the Paypal transaction ID and we will issue the rest of the serials when you are ready. 22. How can I execute Houdini MC without an internet connection? 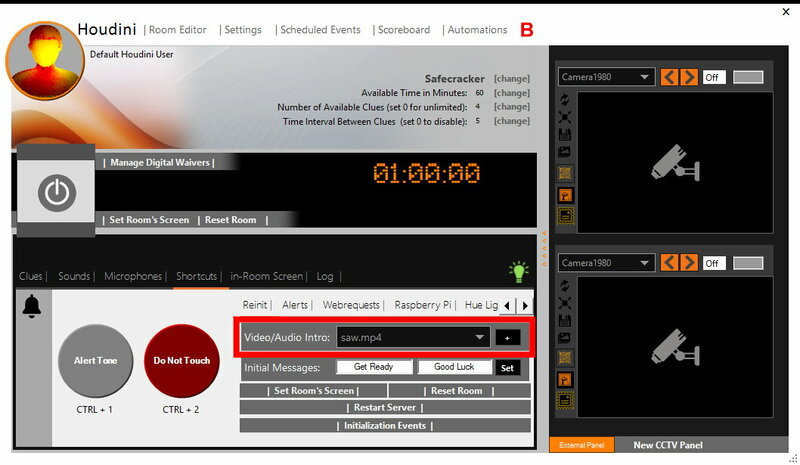 To synchronize the timers, go on Shortcuts tab-> Raspberry Pi, select the appropriate device, connect and click on the “Clock” icon. 24. How can I connect a <Panic Button> or a <Clue Button> with Houdini MC? 25. How can I remotely start a game? 26. 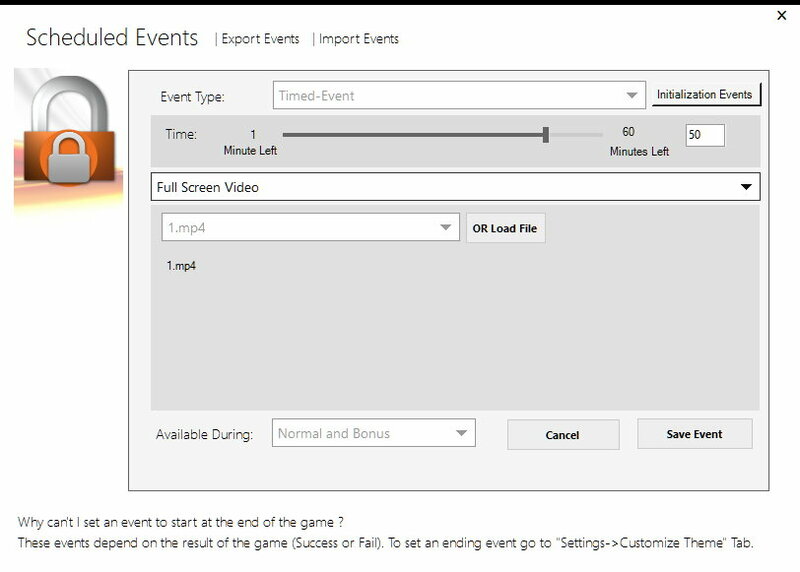 We need help cleaning any pre-programmed audio and video timed-events! 27. Houdini MC is no longer available on my PC! The installation folder exists but the executable file is not there! Your antivirus deleted an important file thinking it was defective/suspicious. This is definitely a false alarm. Houdini MC is 100% clean of spyware and viruses and the vast majority of well-known antivirus systems marked Houdini MC as a totally safe to install the product. Please check the VirusTotal report. To solve this issue add Houdini MC as an exception on your antivirus settings. 28. I was just wondering if it is possible to make a video clue full screen rather than just being a square in the middle of the screen? If you still face the “black frame” around the video issue, go on <Settings->Customize Theme (1/2)> and set the clues’ background as transparent. This will minimize the influence of the frame. 29. There is a requirement to completely hide the countdown on the clue screen such that players should not know the time left. Is this possible? 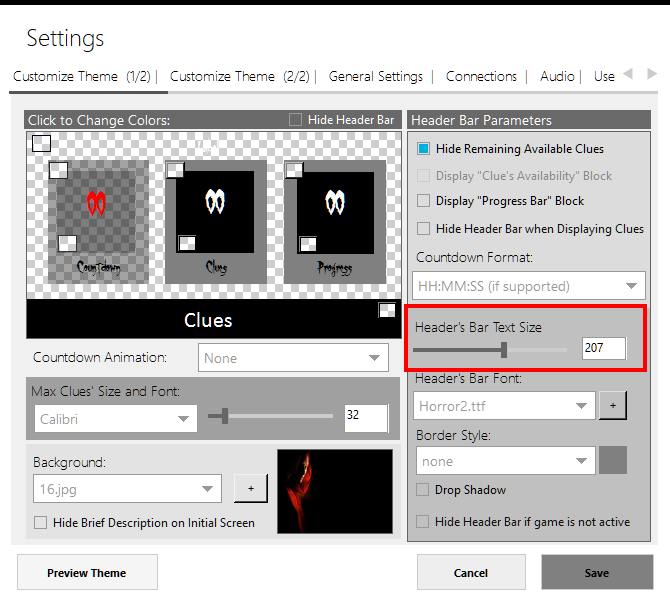 Sure, go on <Settings->Customize Theme (1/2)> and check the “Hide Header Bar” checkbox. 30. Does Houdini MC support a game-master having a microphone that the sound can be heard through the in-room TV speakers? 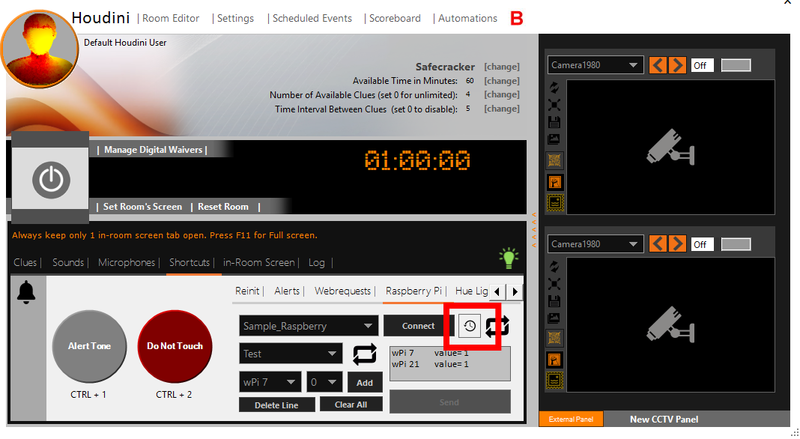 On the left side of the toggle button, a combo box allows the game master to select the connected microphone (see attached image – section 2) while on the right, a combo box allows the game master to select the destination (speakers) (see attached image – section 3). Please note that if you choose the “Room’s Screen” option, the voice will be transmitted directly to the TV through the HDMI cable. It is worth noting that this feature is available only in case of HDMI connection. 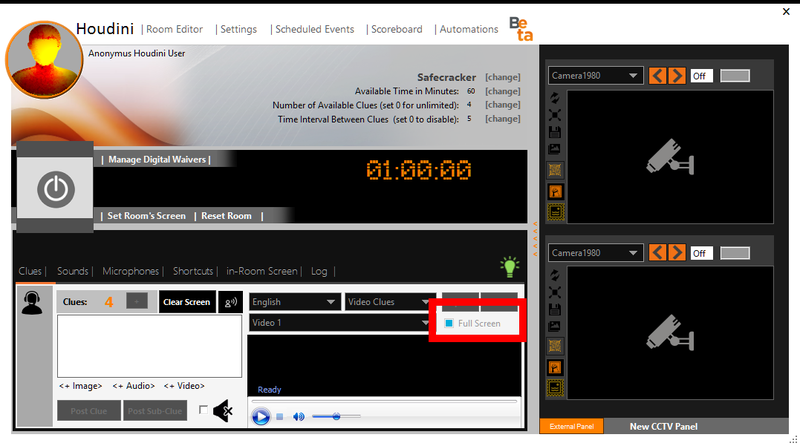 Also, keep in mind that during the first execution, a message will appear on the in-room screen, asking for permission. When prompted, choose Allow. Every time you “transmit” your voice, an appropriate image is depicted on the in-room screen. To customize this image go on <Settings->Customize Theme (2/2)> and click on “Intercom Image” to change it. If you want to completely remove the image, select a transparent one! 31. Does Houdini MC support the connection of the in-room microphones? Sure, Houdini MC allows you to connect 2 microphones. To start with, please connect these microphones to the game master PC. If these microphones are accessible through your operating system, they are also accessible through Houdini MC. 32. When time is running and I hit the stop button, it plays a happy song because they are supposed to escape. Where can I find that song set? 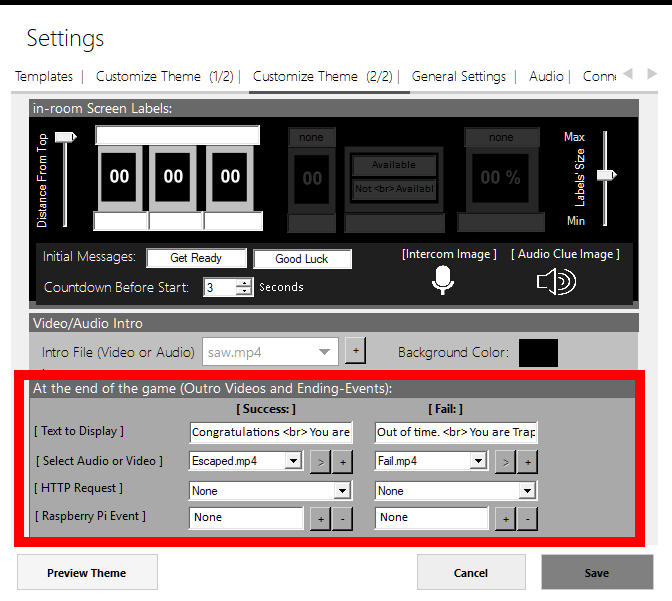 Go on <Settings->Customize Theme (2/2)> and customize the “At the End of the Game” events. From this sub-menu, one can select the text to display in case of success or fail and the appropriate audio OR video. 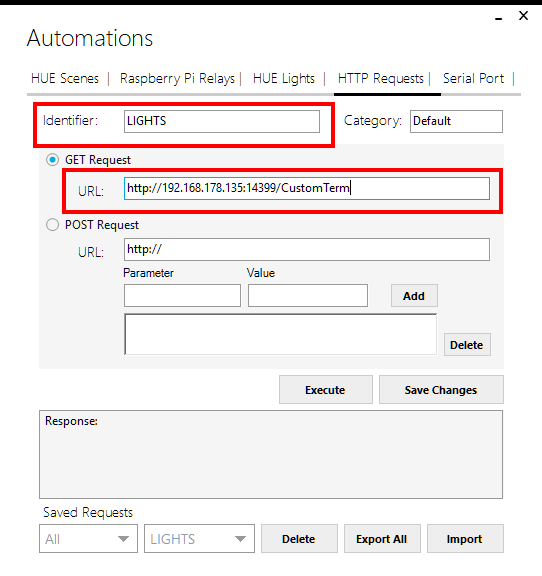 Moreover, game-master can set a set of web requests or Raspberry Pi events for each case. 33. How can I change the <Audio Clue> illustrated image? 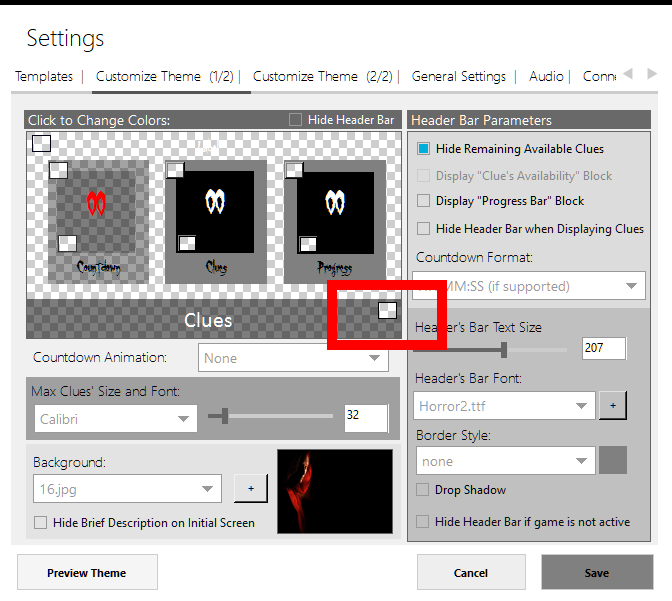 Go on <Settings->Customize Theme (2/2)> and click on “Audio Clue Image” to change it. If you want to completely remove the image, select a transparent one! 34. After our games, we take photos of our groups. Usually, they hold a board displaying their time (which is handwritten). We would like to make this much nicer, using a tablet or monitor displaying a room-specific background and the time of the group. Of course, for the next group which played a different room, it would be good if one could easily switch the room-specific background and the time they achieved. Is it possible to automate this process with Houdini MC? 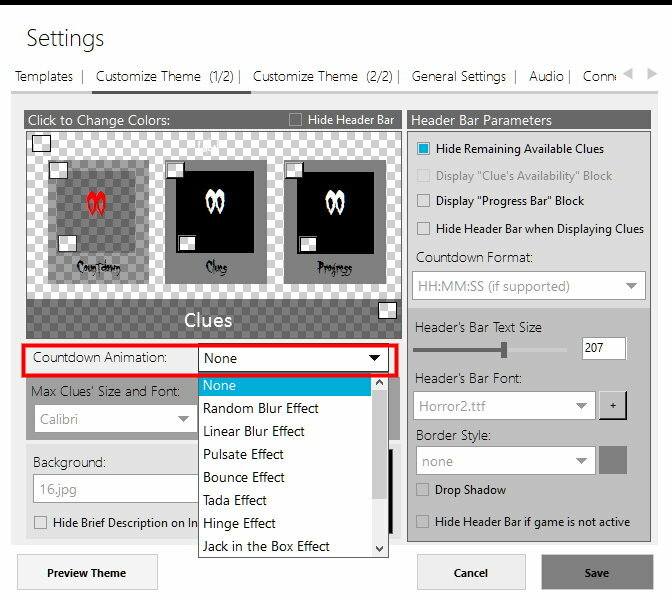 Houdini MC allows the game master to display the remaining time and success or fail message on a tablet, using a custom, related to the room theme. Of course, the players can take pictures holding in their hands this device. Select Background Image, Success and Fail Messages and the fonts. Now, go on <Settings->Connections> and enable <Remote Access> toggle button. Use this URL on a connected on the same network tablet and the custom “Take a Picture” page will load! 35. Is there a list of keyboard shortcuts? Hold [SHIFT] key and left click to select all text clues within a range. Double click to add them on the shoutbox. Hold [CTRL] key and left click to select a text clue. Do it multiple times to select non-consecutive text clues. Double click to add them on the shoutbox. Press [SHIFT]+[ENTER] to post the clues from the shoutbox. Go on <Settings->Connections> tab. Enable the “Incoming HTTP Requests”. Now, every time a connected on the same network device pings this URL when the game is active, the event will be executed! 37. My computer contains only one HDMI port but I use this port for my monitor. How can I connect the in-room TV? Use a different port to connect your monitors such as the VGA or DVI ports. Then, of course, the HDMI port can be used for the in-room screen. In the case of multiple in-room screens, you can use an HDMI splitter. 38. How can I select a custom audio output destination for the video clues? 39. Can I hide the countdown timer when a game is not in progress? 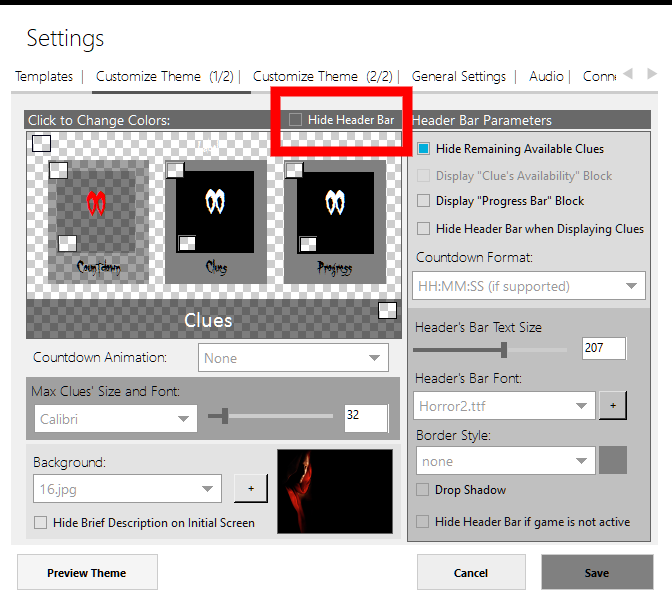 Sure, go on <Settings->Customize Theme (1/2)> and check the “Hide Header Bar if the game is not active”. 40. Can I use QR codes so as to automate the clues procedure? Use the embedded CCTV system and recognize in real time QR Codes. Hide QR Codes in your room. Every time your players show the QR Code to the camera they receive feedback. 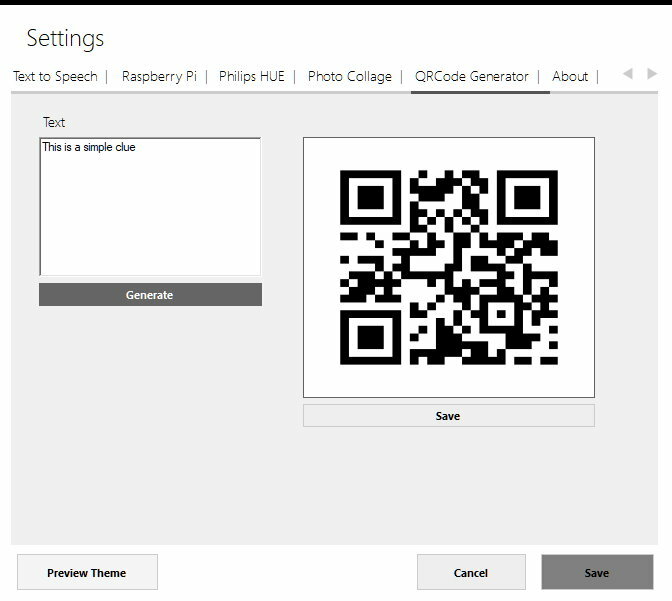 To start with, go on <Settings->QRCode Generator> to produce the QR codes. Type the clue you want to be displayed and press “Generate“. This will produce a file with the QR code. Print this file in an A4 full page. To enable the QR code detection procedure click on the illustrated on the next image button. 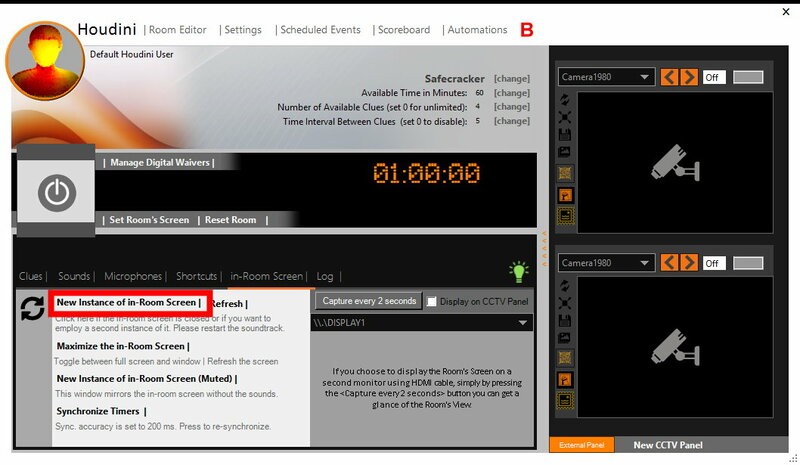 Please make sure that the CCTV system is enabled also and your cameras are 100% compatible with Houdini MC. The following barcodes are supported by CCTV based decoder: QR Code, UPC-A, UPC-E, EAN-8, EAN-13, Code 39, Code 93, Code 128, ITF, Codabar, MSI, RSS-14, Data Matrix, Aztec and PDF-417. 41. Can I preview a theme? 41. Can you please demonstrate me a theme with an analog timer instead of the traditional digital one? 42. Some of your videos present animation effects on countdown timers. How can I enable these effects on my theme? 43. 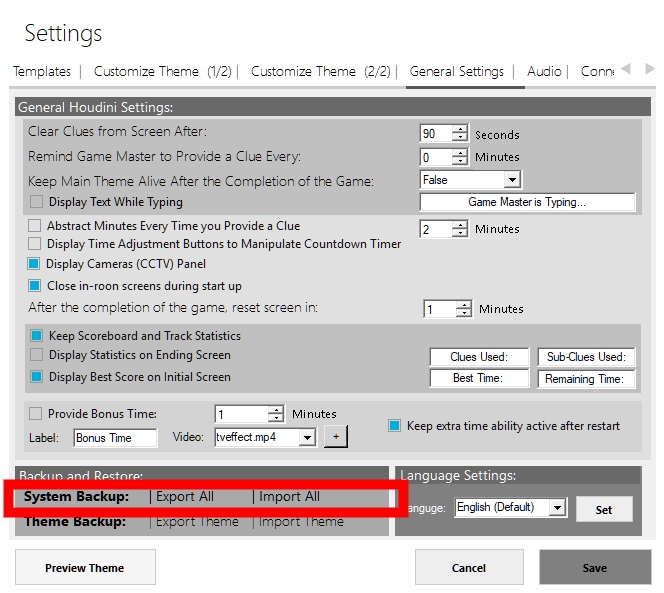 How can I add or remove minutes on the countdown timer when a game is active? Kindly refer to this tutorial. 44. Does your system supports digital waivers? For Houdini purchased users, sWaiver offers the first 12 months of Professional Plan Free (or 50% off for the Business Plan). For more details kindly refer to sWaiver website. 45. What is the famous <We are watching you> feature? Click on the depicted on the next picture button to send a capture! 46.What media formats does Houdini MC support? For the clues, Houdini MC supports .mp3 for audio, .mp4 for video and .jpg, .png, .gif format for image clues. For the in-room screen background, Houdini MC supports .mp4 for video, .gif for animated images and .jpg, & .png format for static backgrounds. For intro/outro multimedia files, Houdini MC supports .mp4 for video and .mp3 for audio. 47. We transmit the in-room screen content on a tablet, but how can we prevent unintended operations on the touch screen and buttons while a game is active? For Android Devices, we suggest our customers download and install Touch Lock app. Apple iOS users can enable Kid Mode on iPad, iPhone, or iPod touch. Windows users can simply connect a USB keyboard to disable and re-enable the touch screen! 48. We try to send web requests to Houdini MC using a micro-controller. The controller is connected on the same network with Houdini MC but the web requests are not working. Outgoing and incoming connections can be affected by the presence of firewall or antivirus software on the PC connection. Windows comes with a built-in Internet Firewall that is active by default and blocks suspicious traffic. You can turn off this firewall (not recommended by Microsoft) or configure it to allow connections from and to specific ports. On the Start menu, click Run, type WF.msc, and then click OK. In the Windows Firewall with Advanced Security, in the left pane, right-click Inbound Rules, and then click New Rule in the action pane. In the Rule Type dialog box, select Port, and then click Next. In the Protocol and Ports dialog box, select ANY. Select Specific local ports, and then type the port number of the instance, such as 14997 for the default Remote Access Port (see image below). Click Next. In the Action dialog box, select Allow the connection and then click Next. In the Profile dialog box, select any profiles that describe the computer connection environment when you want to connect and click Next. In the Name dialog box, type a name and description for this rule, and then click Finish. 49. We're developing more languages to play the game in. It is quite easy to change the language of the clues, but an obvious necessity is also the change of the intro video. Do we have to visit the settings menu so as to select a different video before each different language session? Of course not! 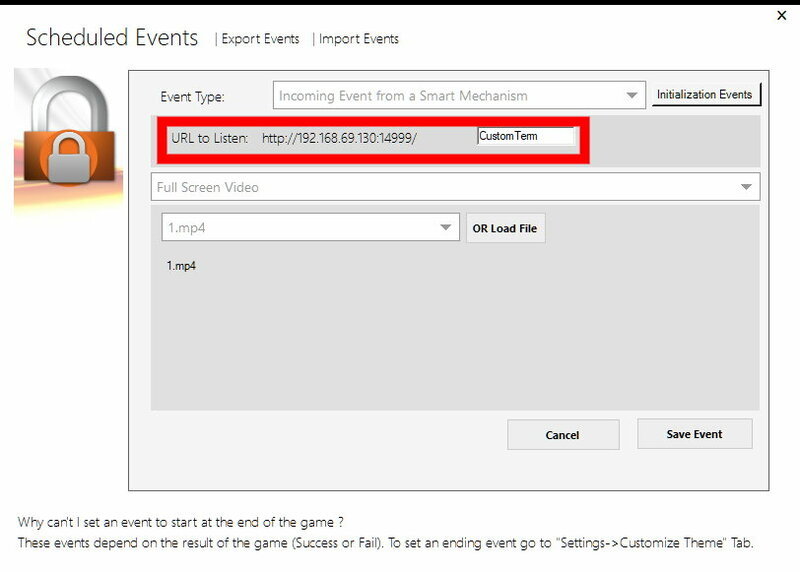 You can directly visit the <Shortcuts> tab and select the appropriate video before starting the game. 50. When I reset a room, can I change the color of a HUE light or send a command to a Raspberry Pi? Of course. Follow this tutorial and replace the “End Game:Fail” event with a custom one (e.g. a combo event, Hue lights etc.) – the one that contains the actions you want to perform every time you reset the room. Similarly to the given tutorial, create a <New incoming event from a smart mechanism> event and assign the desirable actions. 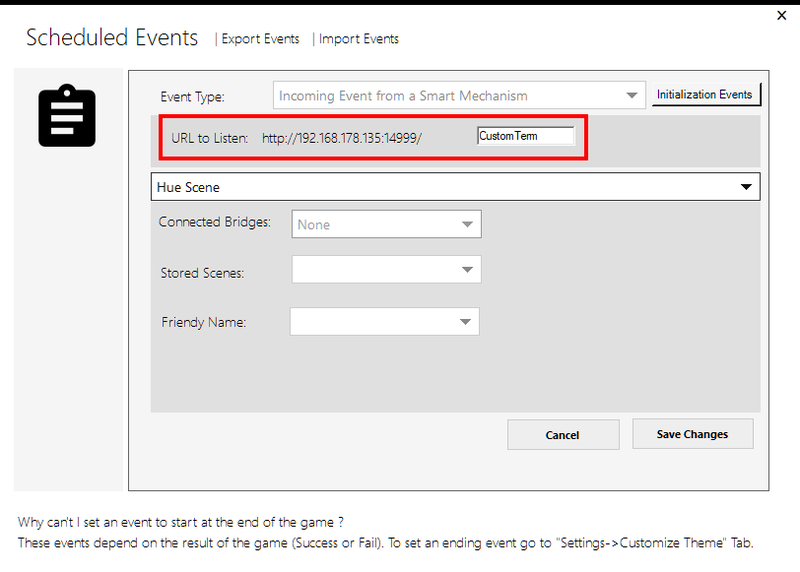 Use a custom term to describe the newly generated event and write down the given URL. Now, return to to <Scheduled Events>, select <Add Event>, then <Initialization Events> menu, and use the drop down menu to select the saved webrequest. [Read More]. 51. We accidentally closed the in-room screen while a game is active. Do we have to restart Houdini MC? 52. How the <Text Clue to Voice> feature works? 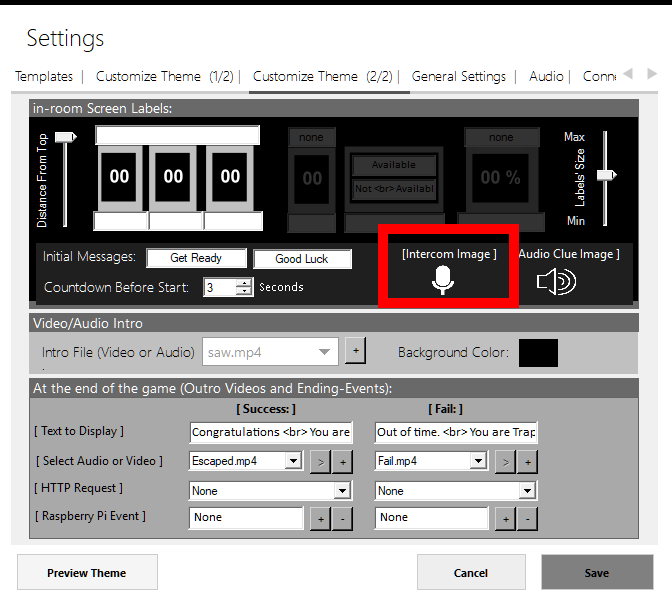 When a game is in progress, write a clue on the shout-box and click on the depicted on the following image button to convert it to voice. 53. Is it possible to have scheduled events that only trigger in Bonus-Time? Sure. 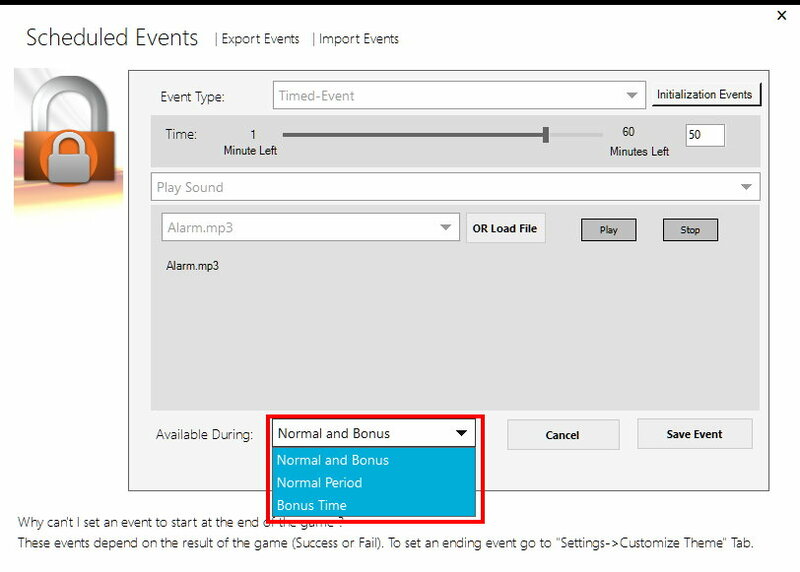 You can assign an event to be executed during the normal time period, during the bonus time period or in both periods. Use <Scheduled events> menu, add a new event or edit an existing one and set your preferences using the <Available During> drop down menu. 54. Houdini MC was working perfectly for months, but suddenly, it doesn't launch? 55. Do you know why the second screen (the one in the room) is showing a vertical scroll bar? More importantly, do you know how to eliminate the scroll bar? 56. 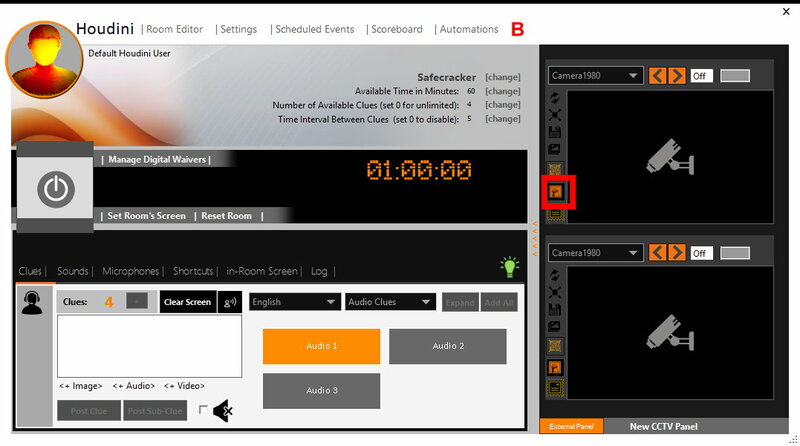 The counter in the in-room screen starts from 39:00, while the counter on the master console starts from 60:00. There is NO synchronization between the in-room screen and the master console counters, but sounds and clues work perfectly. We use the HDMI connection. 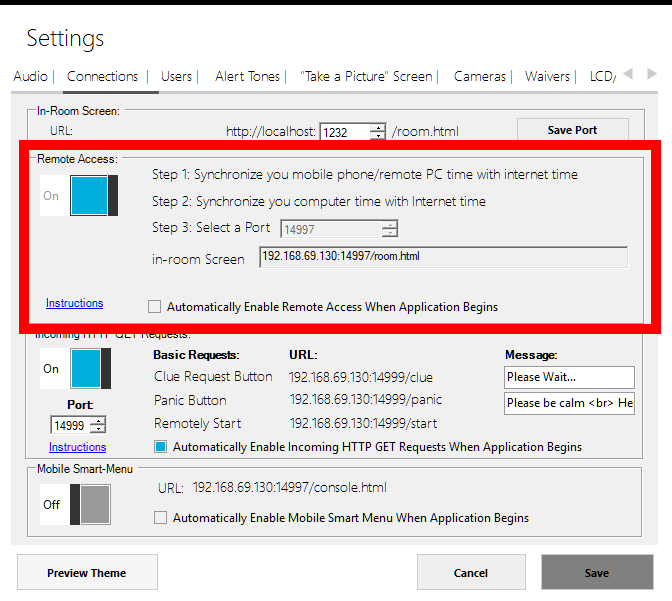 Please make sure that your PC time is sync with internet time. 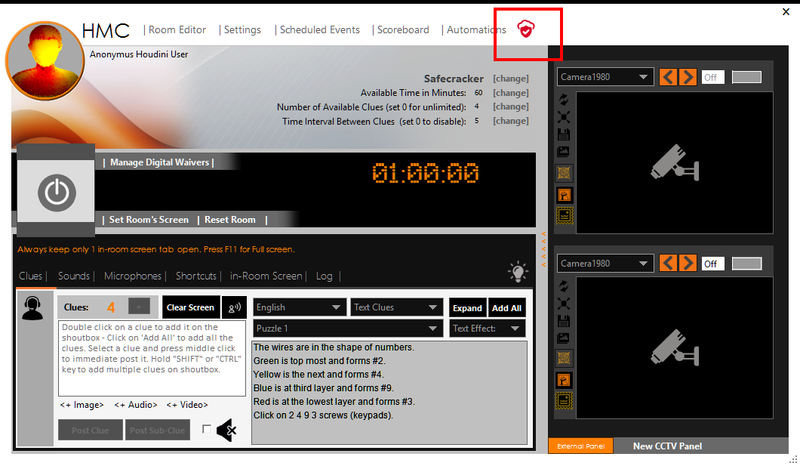 Right click on the time display at the right bottom of the screen & click on Adjust date/time. Then go to time zone setting & select your appropriate time zone. If the time is auto-corrected, it’s done! If not, either you set your time manually or sync your time with the Internet time server. 57. Is there a way to change the orientation of the in-room screen? 58. Can I change the way text clues appear on the in-room screen? 59. In-room screen stuck on loading screen. How can I fix this? 60. How do I set up a Hue Scene to play either when a team wins or looses? Press <Save Changes> and exit the menu. 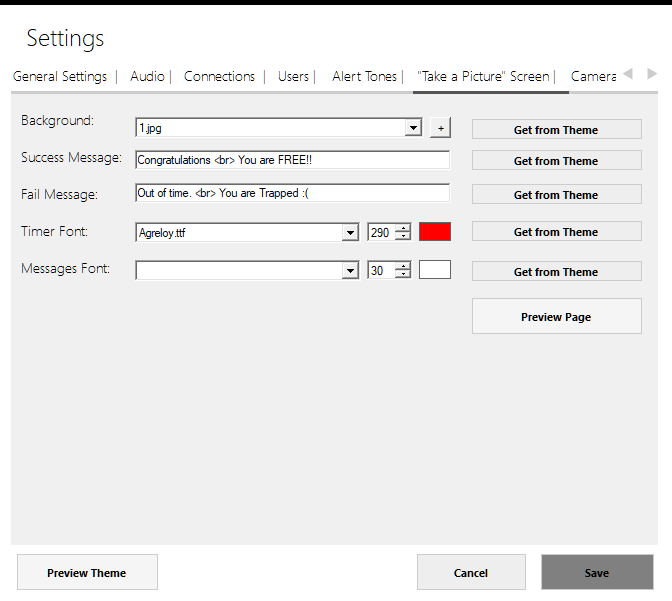 Now go on <Settings-Customize Theme 2/2>. and select as an HTTP request to be executed when a game is completed. Of course, you can create a different web request for each case (success or fail). Finally, go on <Settings-Connections> and enable the <Incoming HTTP GET requests> toggle menu. 61. How to update Houdini MC? A notification icon informs the users whenever a new version is available. Red color indicates that a new version is available. Execute the downloaded file (installer). The installer informs the users about both, the installed version and the newly available one. 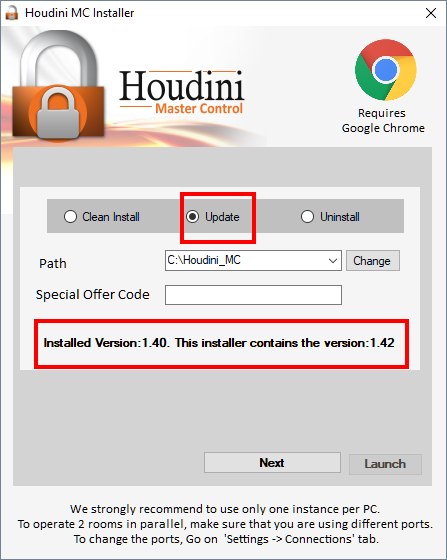 If the installer contains a newer version of Houdini MC, the “Update” (see image below) radio button will be activated. Press <Next> and wait a few moments. 62. How remote support works? We offer remote support using TeamViewer. 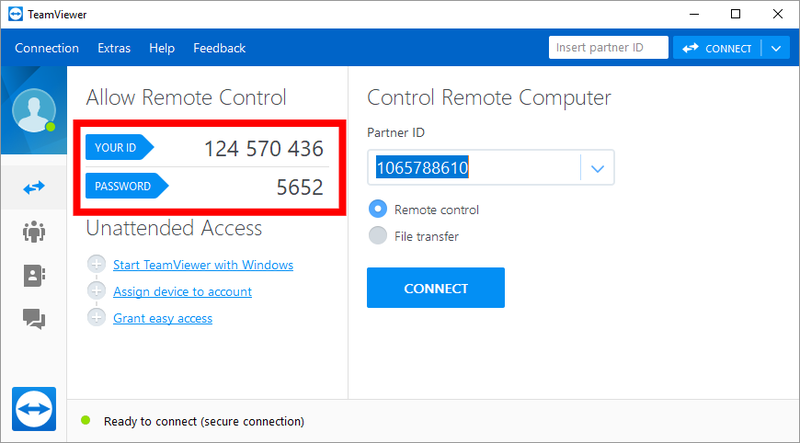 The remote maintenance software “TeamViewer” enables our support staff to see your screen and/or to control your computer to offer precise assistance. You will need to let us know your TeamViewer ID and its password to allow us to connect. For Android tablets/phones please follow this tutorial to change the <Play sounds> permission. Moreover, Google introduced a new flag in Chrome 61 which gives users of the web browser control over the browser’s autoplay behavior. 64. I use one PC to shape the theme and the room parameters. How can I transfer my work to a different PC? 65. The font for the clues on the in-room screen are really small. So I increased to the maximized size in the room editor. I then went to settings and adjusted the max clues size and font to 76 and the clues are still small. Is there something that I am doing wrong? 66. What Is Beta version? When there’s a Beta version of Houdini MC you’re really fond of, should you use it? You’re excited to see the new features, but also cautious about potential drawbacks.In general, Beta refers to the phase in software development between the alpha phase and the final (also called stable) phase. Beta software is generally considered “complete” by the developer but still not ready for general use due to a lack of testing. Beta software serves one main purpose: to test performance and identify bugs. Allowing beta testers to try out Houdini MC and provide feedback to the developer is a great way for the program to get some real-world experience and to identify how it will work when it’s out of beta. Our suggestion is to use our Beta version on a completely controlled environment and only if you understand the risks. 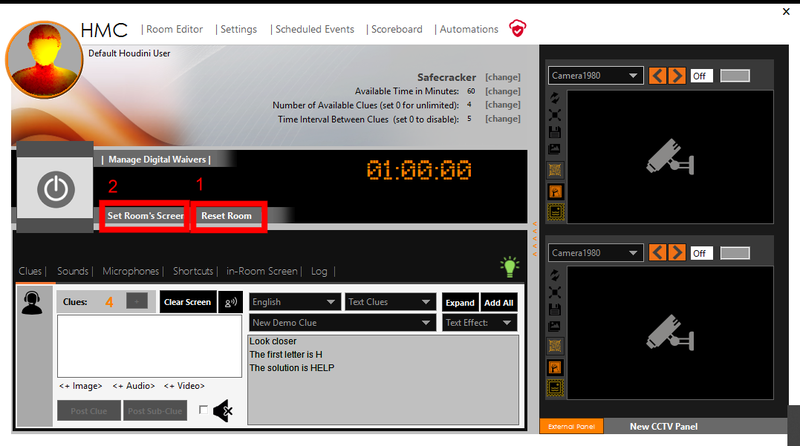 This tutorial briefly guides you in single steps on how to store the room parameters. 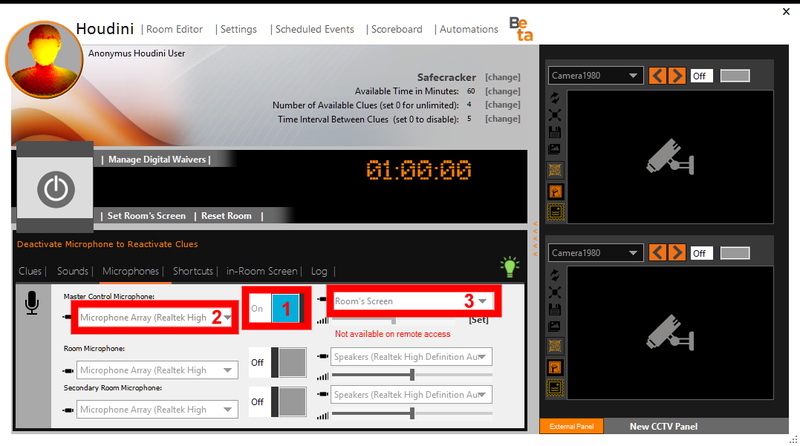 Step 0: Open room editor and click on the "Select an existing or create a new one"
This tutorial briefly describes how Houdini MC can connect the Game Master Room with the In-Room Monitor. Please note that all the following solutions support more than one in-room screens. Connecting a push button with Houdini MC was never easier. You will need only a Raspberry Pi and a push button. 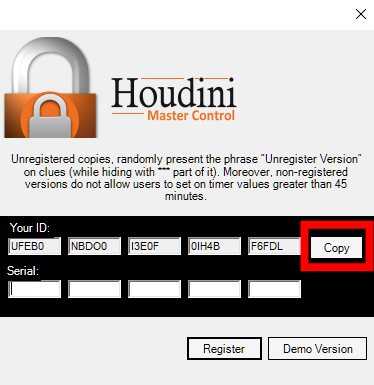 To start with, execute Houdini MC and go to "Settings->Connections"
Houdini MC is a powerful tool that let you control your Escape rooms, without the need of any other third-party software. Send clues, display countdown timer, orchestrate the soundtrack, trigger ANY of the digital props within the room, control the lights, connect physical buttons, interact with QR Codes, display scoreboards on your lobby and much more, using one software.